With McAfee Complete Endpoint Protection — Business, you can spend more time on your business and less time worrying about security. This highly affordable, all-in-one solution provides top-rated endpoint security for all the devices in your enterprise: PCs, Macs, Linux systems, servers, virtual systems, smartphones, and tablets. Quickly and easily layer in protection against today’s most advanced threats, including encryption to protect your valuable data, behavioral zero-day intrusion prevention against attacks, hardware-enhanced protection against low-level, stealthy malware, and email, web, and mobile security to block phishing and multistage attacks. Easy installation and unified management reduce setup and maintenance. You can respond faster than ever. Complete protection — Today, antivirus alone isn’t enough to defend against sophisticated, stealthy malware and attacks. The highest scoring vendor in an NSS Labs comparative test of current defenses against evasion attacks, McAfee finds, fixes, and freezes malware fast with multiple layers of protection. Hardware-enhanced system protection below the OS, available only from McAfee, targets stealthy attacks like rootkits that burrow deep into the kernel. And strong encryption secures your vital confidential data and prevents unauthorized access to PCs, Macs, laptops, and removable media — transparently and without slowing system performance. Behavior and reputation systems integrate with the cloud-based McAfee Global Threat Intelligence to protect against emerging cyberthreats across all vectors — file, web, message, and network. Complete simplicity — With as few as four clicks and in as little as 20 minutes, you can be up and running. Web-based single console management with McAfee ePolicy Orchestrator software makes it easy to manage policies across all protections and systems and get instant visibility into security health across your entire infrastructure. With new real-time management, you can ask questions and fix vulnerabilities or correct problems faster than ever before. Complete performance — Are you looking for security that supports business instead of slowing it down? Complete Endpoint Protection — Business minimizes security’s impact on users with fewer, smarter scans and advanced memory management. These technologies optimize CPU and memory usage to make strong security transparent to users across all platforms. Defend all your endpoint devices, from traditional desktops and laptops to storage servers and mobile devices, with the industry’s highest scoring protection. McAfee® Complete Endpoint Protection—Business suite, an affordable, all-in-one solution, includes encryption to protect your valuable data, behavioral zero-day intrusion prevention for insidious exploits, hardware-enhanced protection against stealthy malware, as well as email, web, and mobile security to block phishing and multistage attacks. Single-console, web-based management eases the day-to-day burden on your IT staff and empowers them to act fast when threats strike. Make endpoint security painless for your users and IT. McAfee Complete Endpoint Protection—Business helps growing organizations get security right, from turnkey installation to rapid response. With one unified solution, you cover all the devices in your enterprise—PCs, Macs, Linux systems, servers, smartphones, and tablets. Reduce complexity, cut costs, and protect against rootkits, mobile malware, targeted web and email attacks, and persistent threats. You get powerful, efficient protection and straightforward management that’s available only from McAfee, the market leader in endpoint security. Get fast, top-rated hardware-enhanced protection against today’s toughest and stealthiest threats. Act in real time to fix vulnerabilities and stop threats in their tracks. Secure confidential data on all devices and removable media while you share files securely. License one product to protect all your business assets: PCs, Macs, Linux systems, servers, virtual systems, smartphones, and tablets. Advanced antivirus, anti-malware, host intrusion prevention, device control, host-based firewall, encryption, and more tackle malware, zero-day threats, and evasion attacks at every vector — mobile, data, web, and email. We keep it simple for IT administrators to take charge. Install your suite with just four clicks and in less than 20 minutes. Add licenses and products using the same management platform as your business grows. McAfee ePolicy Orchestrator (McAfee ePO) single-console management streamlines and automates workflow, policy deployment, updates, maintenance, and reporting across all of the technologies that protect your endpoints. Integration with other McAfee and third-party products further increases visibility and efficiency as you add to your security arsenal. Real Time for McAfee ePO gives administrators instant access to critical data within the natural McAfee ePO workflow, getting answers and taking action to manage security and respond as much as 10 to 1,000 times faster. Deploy industry-leading file, folder, and full disk encryption to secure confidential data across PCs, laptops, network servers, and removable media. Quickly enforce organization-wide encryption policies that are automatic and transparent to users, so files can be securely shared, stored, and transported. One infected system can bring your business down, and antivirus alone just isn’t strong enough for today’s sophisticated threats. When it comes to threat protection, you can’t do any better than McAfee Complete Endpoint Protection—Business. In a recent NSS Labs test, McAfee was ranked the top-scoring vendor in defending against exploits and evasion attacks. McAfee Deep Defender leverages McAfee and Intel technology for industry-first hardware-enhanced security beyond the operating system (OS). 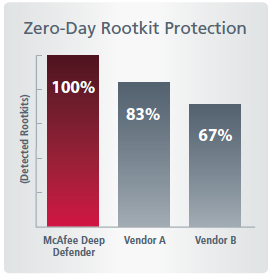 McAfee earned a perfect score for protection against rootkits that burrow deep into the kernel in a comparative review by AV-TEST. Get proactive about protecting your data. A leader in the Gartner Magic Quadrant for Mobile Data Protection and in the Magic Quadrant for Endpoint Protection Platforms, McAfee provides multiple layers of protection. With advanced encryption, you can automatically secure confidential information and prevent unauthorized access on PCs, Macs, laptops, virtual machines, and removable media. Safeguard your vital assets without hindering system performance—and easily manage and enforce policies from the McAfee® ePolicy Orchestrator® (McAfee ePO™) centralized, web-based management platform. You may not have security experts in every office—that’s why we keep it simple. Your security is installed and ready to go in as few as four clicks. Management is easy with McAfee ePO software—a single pane of glass where you can view security and manage policies for all devices. Real Time for McAfee ePO gives you instant access to critical security data, so IT can respond 10 to 1,000 times faster when incidents occur. Focused scans and focused actions provide you with security that supports business rather than slowing it down. Superior performance across all platforms comes from advanced smart scanning and memory management techniques that optimize CPU and memory usage. McAfee Complete Endpoint Protection—Business brings together a strong set of proactive defenses to protect you against today’s complex threats at every stage. Here’s how we minimize risk in a typical attack scenario. Protect valuable data with encryption for files, folders, and full disks. Goal of attack is achieved—from stealing identities and intellectual property theft to bank fraud. Host-based firewalls prevent connections to known malicious bot networks and limit the loss of sensitive data. Protect email server and intercept malware before it reaches user inboxes. Full Disk, File, Folder and Removable Media Encryption Secure confidential data across PCs, Macs, laptops, network servers, and removable media. 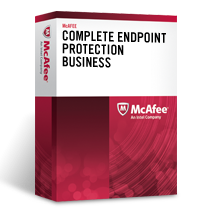 Download the McAfee Complete Endpoint Protection — Business Datasheet (PDF).